Keep your kids occupied RIGHT NOW! The conference all is starting! AAAAHHHHHH! We’ve all been there. 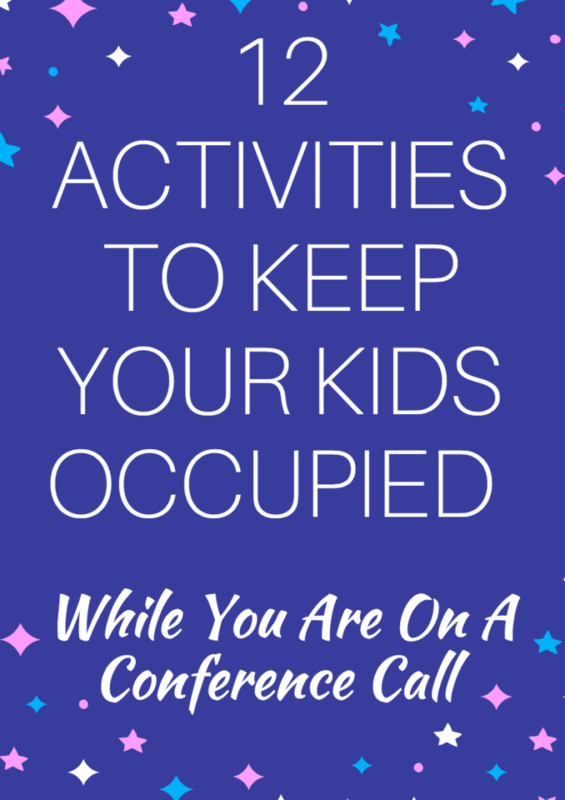 Conference calls are a necessary evil for the work-at-home mom. There’s no way around them. Not everything can be done via email. I mean, I WISH that was the case – but for some reason, the rest of society likes human interaction. Don’t get me started on Zoom! Every time I see one of those links come through I just about pass out because it means a shower and a full house revamp. My life is chaotic ENOUGH. Look, I get it all done and get it all done with pride… but I don’t typically like people taking a peek behind my curtain. How I end up at the finish line is my secret – and it’s a messy one. In other words, how on EARTH do I manage to run a business out of my home with three kids and not lose my mind? That’s what women are really asking me. They aren’t asking me how I earn the money I earn. They aren’t asking me how I align myself with top tier companies. These women are asking me do I get through a full week while still holding onto my sanity and then wake up on Monday and choose to do it all over again. I think the answer isn’t so simple. I know I was born differently than most people I know. I don’t just shut down. I am constantly thinking of different ways to make money or ways to improve relations with clients or ways to improve my brand. I never turn off. That’s actually pretty sad if you think about it. However, there is another side to the coin – planning. I am the ultimate planner, a spreadsheet maker, a goal keeper. I am very organized when it comes to work. Not so much my personal life! LOL! But if you want to know anything about my business plan, I will take you down a very dark rabbit hole called ” Google Drive” and I will blow your mind. I prepare several different coloring pages and printables for my children to enjoy. I have so many to choose from here –> they are all free. Keeping construction paper and glue on hand to keep your kids occupied in case you have a last minute call pop up on your calendar is always a good idea. Hop on over to a site like this, choose an idea that you feel your child can handle on their own, and leave the instructions up on your computer OR print out instructions for them to reference later. Do you have any paper plates? They are great arts and craft tools! Check out some examples here and here. Give your children some crayons and plates and let their imaginations soar. Nature Art is so much fun because it allows the kids to spend some time outdoors! Keep your kids occupied while you watch from the window, letting the kids explore the backyard for supplies they will need to create their own piece of art – like this one. Friendship bracelets were so 80s, right? Well, I used to love them and my daughter does too! Here’s a great video showcasing a few easy patterns. Just be sure to have the string on hand. Like I said – it’s good to be prepared for future calls. Have these products stored away for a rainy day, errrr, I mean a conference call. Boredom Busters from BuzzFeed – there are a few great ideas here. I particularly like the Solo Red Cup tower, but I wanted to link them all for your consumption. Floating Ball Activity – Have the kids construct and then compete against one another for who can hold the ball up the longest. Reading a Book – no link needed. Magazines for Kids – Think about subscribing to magazines like National Geographic for Kids, Highlights, or any other kid-centric magazine and pull them out only when you are on a conference call. We live in such a digital age, that we tend to forget about books and magazines. Remember how fun it used to be when you got mail!! I used to think it was so special! Knitting is such a great skill to teach children – my daughter’s best friend is an avid knitter and I love when she sends along scarves and hats for us to enjoy. Learning games on the iPad can’t hurt. Pop in their favorite movie. Do you have any tips you’d like to add to keep your kids occupied? Would love to hear them because you know that I am in the same boat as you! While a work-at-home mom has unique struggles of her own, I will say that I wouldn’t have it any other way. I will take hiding in the bathing while taking a conference call any day of the week. I know it sounds crazy, but I feel so lucky that I get to be home with my kids while still building out my business. It’s almost like I am getting the best of both worlds!! Previous Post: « 50% Off Lands’ End Backpacks Today Only!